When it comes to portable audio, an MP3 player or phone in conjunction with a nice set of earbuds is as compact as you can go. Thanks to their small size and practicality, earbuds are among the most popular kind of headphones currently on the market. That doesn’t mean, though, that just buying any pair of earbuds will do you any good. The opposite is true, in fact: Thanks to a highly saturated market, true gems are hard to find, even more so if you happen to be on a tight budget. So, the question is, out of hundreds upon hundreds of choices, most of them anything but affordable, which are the Best Earbuds under 100 dollar out there? Read on if you want to find out. Made by luxury firm Bose, the SoundSports are designed to offer almost anything and everything one could wish for in a pair of earbuds: Comfort, great sound, style and a practicality-focused design. This model excels at all of the above, making it a potent performer in real-life testing. Sure, they do tip the scale in terms of price, coming it at $99, but you really get what you pay for. 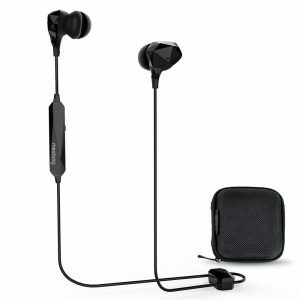 Included in the price are not just the earbuds, but also three pairs of interchangeable, differently-sized, sweat-resistant ear-tips, in-line volume and microphone controls and a luxuriously finished, Bose-branded carrying pouch. The ear-tips in particular are a favorite of ours. Not only is it a great idea to ship the tips in three different sizes to accommodate different ear shapes, but the design itself is also well-thought-out, with an excellent choice of material, mostly silicone, which is both very comfortable and weather-proof, as well as an ingenious shape. They feature ‘wings’ that are angled upwards, effectively locking the earbuds in place while they’re worn and preventing them from slipping off of the wearer’s ears. The only thing we didn’t like? The cable on the SoundSports lacks any kind of rigid plastic at either end to prevent it from fraying. Add to that its lightness, thin profile and the fact that it comes unbraided and we can’t help but fear that the SoundSports, irrespective of their quality, are not as durable as one might want them to be. All in all, the Bose SoundSports present themselves as some of the best earbuds on the market today, thanks to an incredibly high price-performance ratio, tons of style and everything else that’s associated with owning a Bose product. However, slight build quality issues and the high price could be a turnoff for some buyers. 1MORE may not be a well-known brand name, but their lineup of affordable, yet highly practical earbuds surely impresses. Their top-of-the-line sub-$100 model is simply called the Triple Driver due to the unique arrangement of, well, triple drivers which can put out some very impressive sound. But even apart from that, the 1MORE’s have got a lot to offer. On the luxury front, they come bundled with a total of nine interchangeable sets of silicone ear-tips to accommodate literally any ear shape and size out there. In addition to in-line controls and some truly luxurious packaging, styled to resemble hand-written book, which includes the earbuds themselves. All ear-tips neatly sorted, the bundled charger, the instruction booklet as well as a small leather pocket to store your earbuds in when you don’t need them. Some truly nice little details round off the picture, like gold accents and a beautifully braided connector cable. However, we do miss the winged ear-tips from the Bose SoundSports and the 3.5 mm audio connector. Although gold-colored, is not as sturdy as it looks and can easily be irreparably damaged by just bending it slightly with your fingers. A small design flaw, but one that could cost the owner $99. In spite of their flaws, the 1MORE Triple Drivers are a truly interesting pair of earbuds to own. Perfect for music enthusiasts and those who just want a stylish way to listen to their favorite tunes. They excel at almost any discipline we can test them in. Please, 1MORE, just round off the few nitpicks that there still are and you’ll have the best pair of sub-$100 earbuds on the market. We promise. 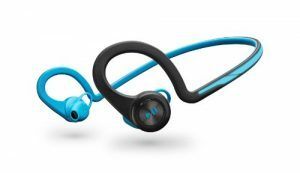 For $85, world-renowned communications and audio equipment manufacturer Plantronics offers the Backbeat Fits, earbuds designed for sports and fitness enthusiasts. Featuring fixed, non-replaceable silicone ear-tips, fully sweat- and water-resistant, of course, with built-in wings and…not much else. The Backbeat Fit are easily recognizable as an inherently basic pair of earbuds. The thick, colored cable connecting both drivers is made to withstand the test of time and feels solid, thoroughly rigid even when flexing it by force. An audio cable is redundant as the Backbeat Fits connect wirelessly to your phone via Bluetooth. Overall, they sport a high-quality construction which we like. But make no mistake, the Backbeat Fits don’t even play in the same league as the 1MORE Triple Drivers above, for example. As such, you don’t get anything besides the average sound quality and the Bluetooth implementation out of the box. No in-line controls, no fancy materials, no extras, no pouch, no exchangeable ear-tips. Just a pair of headphones to go to the gym with. So, in short, if you are looking for a strictly basic pair of reliable, well-built earbuds under $100, you just found them. All of those who want near-headphone functionality, though, move on. 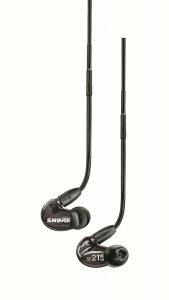 The SE-215 by Shure are designed for general use, with no obvious or overly specific demographic recognizable at first hand. They are available in three rather unusual color schemes, Black, White and Clear, but apart from that, it’s all very straightforward. You get six sets of ear-tips and a long, braided audio cable as well as a small pouch for storing all of that stuff. Although there are no real wings, the audio cable exits the earbuds at an angle that facilitates wearing them draped around your ear, mimicking the use of wings, albeit in a less refined way. That’s it. For what they are, the Shures perform well. With above-average sound quality, a comfortable fit and enough individuality thanks to the color schemes. 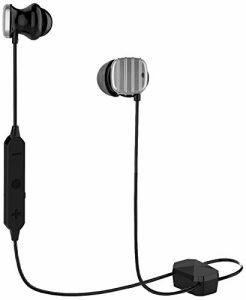 But unfortunately, the asking price, $99, seems a little high for a pair of earbuds that is much more ill-equipped compared to most contenders on our list. So, in total, the Shure SE215s offer a reasonably high-quality portable audio experience. But they unfortunately fall flat on their face when it comes to their price-performance ratio. There’s just not that much to justify the $99, at least when you compare them to the competition. Still, if you ignore the price tag for a moment, the SE215s are really solid earbuds, and there’s no question about that. Sennheiser, who have been called the undisputed king of portable audio oh-so many times by now, generally tend to neglect earbuds in favor of bulkier, but much better-sounding, over-ear headphones and headsets. 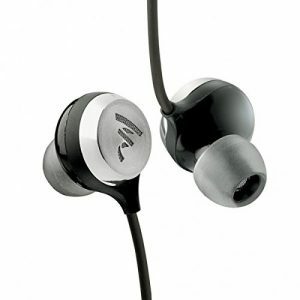 However, the Momentum In-Ears are a noteworthy exception. Named after Sennheiser’s range-topping line of wireless headphones, the Momentum’s sport luxurious looks, high-grade materials, in-line controls. And some of the best sound we’ve heard coming out of a pair of earbuds and all the emotional appeal associated with the Sennheiser brand. All of that goes for $95, making Momentums pretty cost-efficient, a rarity for such a luxury brand. However, we found there to be quite a few issues. Most notably the audio cable, which is unbraided and can fatally rupture at numerous points. And the ear-tips, which, although excellent in terms of feel and noise isolation, are only shipped in one size. Any replacement pair must be purchased separately from Sennheiser. Also, besides the fancy looks, controls and sound quality, the Momentum’s are curiously devoid of any luxury features. Wings, Bluetooth and more would have been nice to have, but for some reason, you won’t find them on the Sennys. So, for the budding audiophile who, for any reason whatsoever, doesn’t want to spend their hard-earned cash on a pair of over-ear ‘cans’, the Momentum In-Ears should pose a good choice. Thanks to great sound quality, practicality and affordability. However, they don’t shine with quite the same light of brilliance and refinement as other Sennheiser products, which makes us question who exactly their intended demographic might be. Cowin, a widely-known manufacturer of affordable audio products, tries to cash in on the in-ear headphone market with their new HE8Ds, priced pretty competitively at $80, though they are available on some online marketplaces for less. On the outset, they look good, literally. Thanks to a metal finish, the HE8Ds can’t really be mistaken for any other make of earbuds, which is great in a market where every second product looks the same. In-line controls, Bluetooth, Active Noise Cancelling, though its practicality can be disputed when it comes to earbuds. And a thoroughly sweat-proof design round off the picture and make the HE8D seem like a really good proposition in terms of sheer value. On the subject of sound, the Cowins don’t disappoint. With great volume, clarity, noise isolation and good playback of vocals and instrumentation at a level of quality and refinement that is more than satisfactory at this price point. There are two large flaws that can be found in this design, though. Firstly, the noise cancelling feature, as nice as it sounds, is basically useless in practice as it not only degrades the Cowins’ sound quality but also fails to truly block out any significant amount of noise. Second of all, and perhaps most importantly, we found the comfort of the HE8Ds to be lackluster compared with its competition. 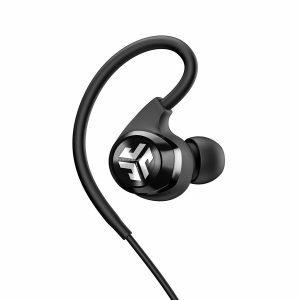 In any case, the Cowin HE8Ds are a great deal for a pair of earbuds at just $80, with lots of features, good build quality and some commendable sound coming out of those tiny drivers. You do have to forgive a few shortcomings when using them, though. For $80, and bundled with Active Noise Cancelling, the Meidong Active Noise Cancelling Earbuds sure make a similar impression to the Cowin HE8Ds above. Some customers even rewarded it as a best earbuds for PS4. Like them, the Meidongs feature a relatively unique exterior design, with polygonal gloss elements instead of flat, metallic surfaces. Apart from that, though, similarities abound. 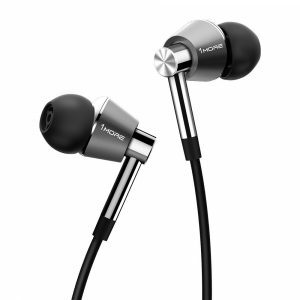 Sound quality is about on par with the Cowins, as is the noise cancelling, even if the reasons for its inclusion in this model remain just as much of a mystery to us as on the HE8Ds given the ANCs relative ineffectiveness in such a low-profile, compact pair of earbuds. One big difference is the inclusion of Bluetooth on the Meidong model, which is a very handy and surprising addition for a pair priced at $80. Furthermore, there are a lot of extras bundled with the Meidongs compared to Cowin’s and other similarly-priced earbuds. Such as removable wings for the ear-tips, which come in three sizes, as well as a nice carrying bag and in-line controls. Still, the plastic build didn’t really impress us that much, and even for $80, Meidong could do better in terms of design, fit and finish. In spite of being far from perfect, and the fact that they seem a little too, shall we say, inspired by the Cowin HE8Ds, the Meidong Bluetooth Earbuds are solid devices, performing well in many disciplines. Yes, they may be cheap in more than one sense, but that also means that for $80, they’re a really good deal, too. The Epic2 from JLab are sports earbuds, that much becomes clear by just taking a quick gander at their design and feature set. Although the ear-tips, of which there are eight pairs in total to choose from, all with different sizes and shapes, don’t feature wings, the audio cable is angled properly and thick enough so it can be worn in a similar fashion, holding the earbuds in place by being wrapped around the ear. Additionally, you get a fully waterproof design with in-line controls, Bluetooth, a carrying bag, an internal mic and a battery that can hold a 12-hour charge. Sounds like everything you need for the average workout, doesn’t it? Indeed it does, but where the Epic2’s slightly disappoint is in an area much more trivial to sports enthusiasts. But at the same time probably one of the paramount criteria for what can be considered ‘good earbuds’ for the average buyer. Of course, we’re talking about sound quality. The Epic2’s possess a pretty muddy and rough sound signature, which we may have excused weren’t it for the static that is constantly audible in the background. It even scales with the volume, so there’s no way to get rid of it! Such a design flaw must mean one thing, and one thing only: The Epic2’s were designed for the kind of buyer who would gladly spend $100 on a product that possessed flaws only in the areas that didn’t matter to them. But what buyer of earbuds doesn’t care the least bit about sound quality? So, if you’re one of those kinds of people who are looking for the $100 pair of earbuds that give them almost anything and everything…apart from sound that you can actually listen to comfortably for any extended amount of time, well, then, go get some JLab Audio Epic2’s. You’ll love them. Sporting a unique, behind-the-ear design and collar, the Sony MDR-XB70BTs seem astoundingly small at first glance. Even for earbud standards. 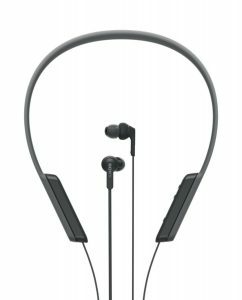 But once you put them on, you realize that’s because all the electronics, along with every convenience feature from Bluetooth and NFC to the in-line controls, are contained within the collar unit, which saves a lot of space for the actual earbuds. Ear-tips come in four sizes and, as expected from a brand like this, the tips are made from silicone. And don’t get us started on the sound. Typical Sony MDR-quality is all that we need to say. The main problem that we found with the XB70BTs was that the weight of the collar constantly pulled the earphones down. Which meant that, although our neck was satisfied with the feel of the whole setup, our ears were not, or at least not as much. The whole strap itself also felt a little too plasticky, and it was hard at first to get it to ‘sit’ properly without moving about on its own. All in all, the Sony MDR-XB70BTs are one interesting pair of earbuds. For just $75, they’re an amazing deal from such a quality brand, but we don’t know whether you can really compare them to any other contenders on our list due to their unique, one-of-a-kind design. However, we do think they’re a very nice pair to try out, especially if all those common earbuds have been disappointing you so far. The High-Resolution Earbuds by Sphear have one goal, one purpose: Maximum sound quality under $100. $90, to be precise. Sure, there’s a built-in mic and some in-line controls for it as well, but it quickly becomes evident that the Sphears’ true strengths lie elsewhere. And? Do they really deliver? Is the sound that good? Well, after testing, we have to say: Yes, yes it is. The reason the Sphears excel at sound quality like no other pair of earbuds do lies within their design. As they are made for optimum sound from the ground up, they are equipped with, for earbud standards, rather large drivers that represent most frequency ranges very well and very easily. We were surprised at how deep and rich the bass sounded in spite of the diminutive size of the hardware creating it, and it only gets better after some days of use as, yes, these earphones actually feature a proper break-in period, further evidence of their full-size headphone-like construction. Of course, because the Sphears occupy the same price range as all others on our list, there are many shortcomings in other areas, especially when it comes to convenience features. There’s no Bluetooth, no elaborate controls, nothing to increase comfort, no carrying bag or accessories to be found. If lush comfort, luxurious add-ons and style are your criteria for a good pair of earbuds, the Sphears are almost anything but good. 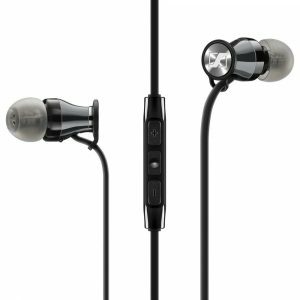 In total, the Sphears In-Ear Headphones may seem like a compromise to some, like a godsend to others. With sound quality that befits audiophiles and a great build in general, we consider the $90 to be well-spent. But, of course, their true value can only be determined by one person, the buyer, which is you, so make up your own mind about them. The Bose SoundSports may not be the best-performing earbuds for under $100 in terms of sheer sound quality or features, but what they are like no other is well-rounded. With the SoundSports, you essentially get a complete mobile sound package including every accessory you’d ever need. Due to them being well-built, you can also rely on the SoundSports for quite a long time if you need to. Simply put, if you need earbuds for under $100, these are the no-nonsense option.. Throughout our overview, we looked at a wide variety of devices. Earbuds for audiophiles, fashionistas or tech freaks, there’s something for everyone. Thus, don’t take our word for it when we talk about ‘the best’. 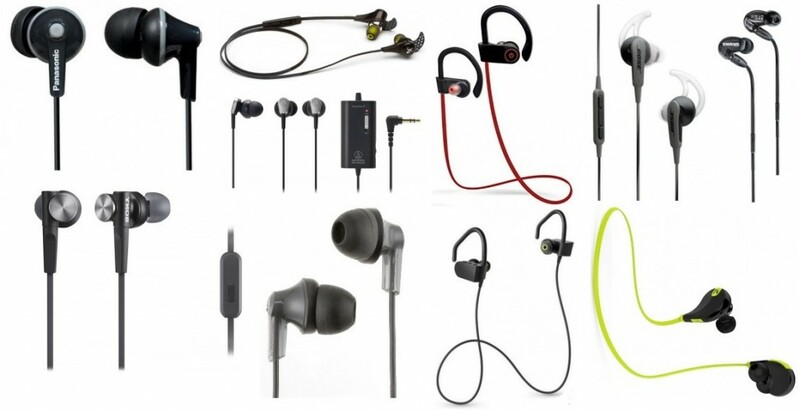 The best can only mean what’s best for your personal requirements, so go out there, try out as many of our recommendations as you can and find out which type of best earbuds under 100 dollar suit you best!